It's fair to say though, that this Tumbler does come with a price to match those three Bs - a gulping hazard-to-your-wallet $469.99 USD. 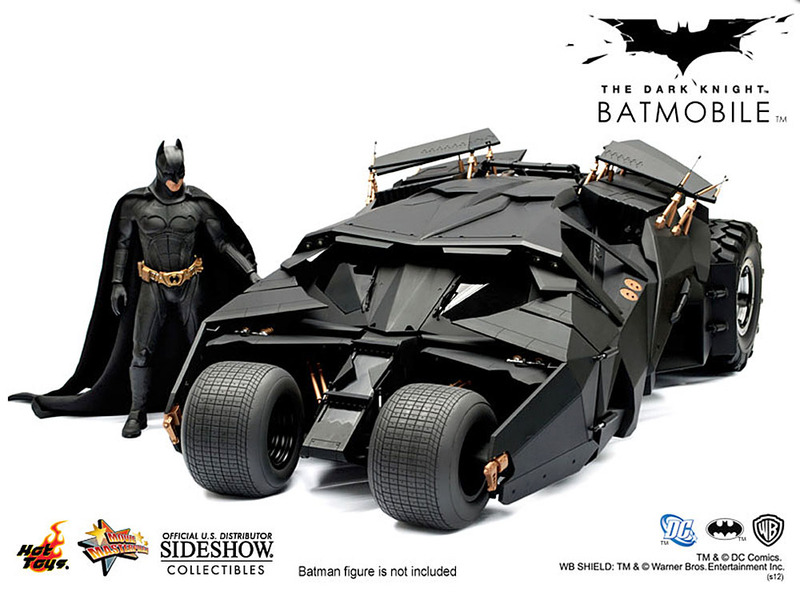 However, if you’re into Batstuff, then you might think of this large - 737 mm (29 in) long - replica as a good investment, and in fact Sideshow offers an installment plan if a cash purchase is out of the question. 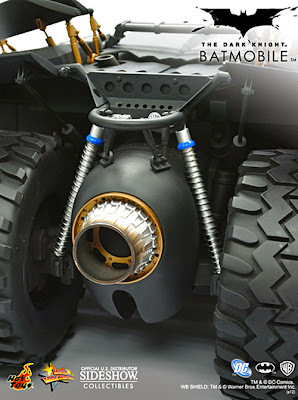 So what does this Tumbler-extreme have to offer? Well, the general spec is pretty much up to what you would expect, with a cockpit packed with detail that includes a particularly convincing head-up display. 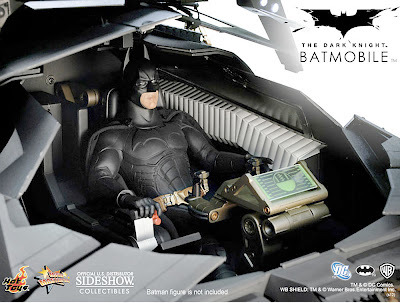 The cockpit is also the right size for a separately available 1:6 scale Batman figure to take command in the sculptured seat. There’s room in the passenger seat for a second figure if you wish, and various elements in this Tumbler are moveable features, too. Apart from the wheels, the roof panel pops up, as do the braking flaps. 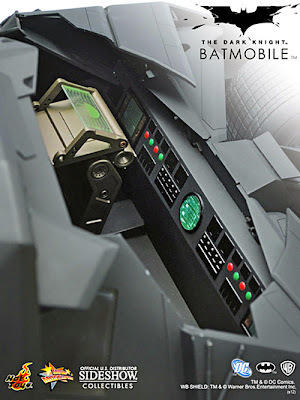 In addition, if you supply three AAA batteries (they’re not included, more’s the pity) then you also get an illuminated function... kill the room lights and you can see a mean machine, its owner looking for trouble. Mind you, we’d like to see a flickering tongue of hot blue fire roaring out of that tail exhaust - ah well, maybe that’ll come with the next edition. All in all, an impressive achievement, though as ever with ready-built models like this, certain members of the SMN Crew itch to give it a spot of light weathering for that final dose of realism. It’s a pity Sideshow doesn’t supply a Batman figure with it though - the Tumbler isn’t really complete without a driver in the cockpit, though you’ll have to apply a weatherbeaten look to his face, as Sideshow’s figure looks very clean indeed - too clean, even for a caped crusader! 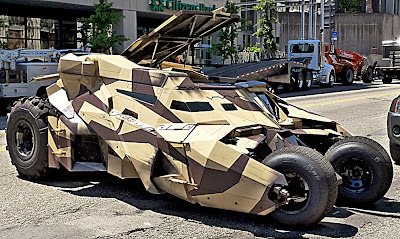 And here's a pic of the Tumbler wearing camo-look paint, as seen in the upcoming Batman movie The Dark Knight Rises, scheduled for worldwide release, starting July 19, 2012. Hot Toys 1:6 scale Batman figure here. 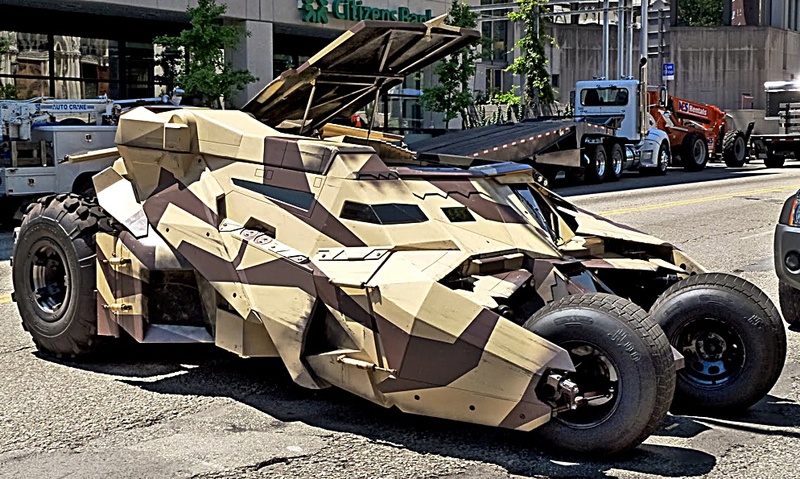 See all sorts of Batmobile here.